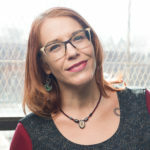 Kelly Robson is an award-winning short fiction writer. She was awarded the 2018 Nebula Award for Best Novelette and the 2016 Aurora Award for best Short Story. She has also been a finalist for the Hugo, Nebula, World Fantasy, Theodore Sturgeon, John W. Campbell, and Sunburst awards. Kelly Robson is an award-winning short fiction writer. 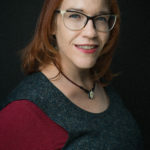 In 2018, her story “A Human Stain” won the Nebula Award for Best Novelette, and in 2016, her novella “Waters of Versailles” won the Prix Aurora Award. She has also been a finalist for the Hugo, Nebula, World Fantasy, Theodore Sturgeon, John W. Campbell, and Sunburst awards. In 2018, her time travel adventure Gods, Monsters and the Lucky Peach debuted to high critical praise. After 22 years in Vancouver, she and her wife, fellow SF writer A.M. Dellamonica, now live in downtown Toronto. Kelly Robson is an award-winning short fiction writer whose work appears in major speculative fiction markets. Many of her stories have been selected for year’s best anthologies, and have been translated internationally. She’s a regular contributor to Clarkesworld’s Another Word column. In 2018, her time travel adventure Gods, Monsters and the Lucky Peach debuted to high critical praise. The book is currently a finalist for the Hugo, Nebula, and Theodore Sturgeon awards. In 2018, her story “A Human Stain” won the Nebula Award for Best Novelette, and her novelette “We Who Live in the Heart” was a finalist for the 2018 Theodore Sturgeon Award. In 2017, she was a finalist for the John W. Campbell Award for Best New Writer. In 2016, her novella “Waters of Versailles” won the Prix Aurora Award and was also a finalist for the Nebula Award and World Fantasy Awards. 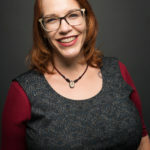 Her short story “The Three Resurrections of Jessica Churchill” was a finalist for the 2015 Theodore Sturgeon Award, and her short story “Two-Year Man” was a finalist for the 2015 Sunburst Award. Growing up in the foothills of the Canadian Rockies, Kelly competed in rodeos and gymkhanas, and was crowned princess of the Hinton Big Horn Rodeo. From 2008 to 2012, she wrote the wine and spirits column for Chatelaine, Canada’s largest women’s magazine. After 22 years in Vancouver, she and her wife, fellow SF writer A.M. Dellamonica, now make their home in downtown Toronto.